Sunway Berhad, the holding company of Malaysian conglomerate, the Sunway Group, is set to explore new avenues of growth to keep up with the changing business landscape, while expanding its portfolio of core businesses domestically and regionally. 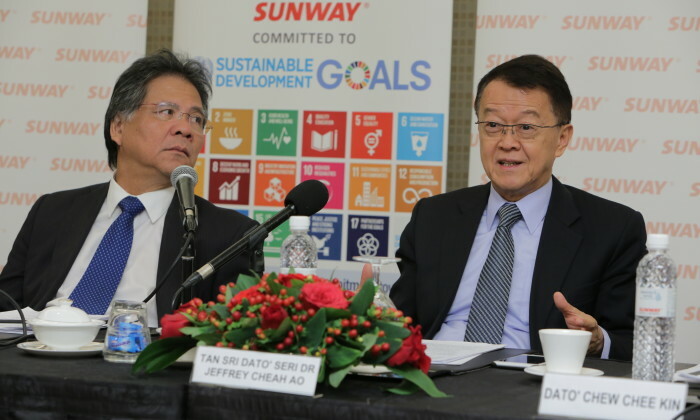 Sunway Group founder and executive chairman Tan Sri Dato’ Sri Dr Jeffrey Cheah AO (pictured right) said while its current businesses are doing well, it is fully aware on its need to find new horizons if it is to “continue to thrive in the decades ahead”. This comes as Sunway Berhad reported a net profit of RM233.3 million in second quarter ended 30 June 2017, a jump of 29.7% from the same quarter last year, due to better performance from most segments including its retail, property, hospitality and education. Profits were also boosted by the share of higher fair value gains from the annual revaluation exercise done on Sunway REIT properties of RM56.8 million in the current quarter, compared to RM23.7 million, previously. Most recently, in a bid to expand its revenue streams, the group formed joint venture (JV) with PopBox Asia called Sunway PopBox, where consumers can drop off and collect their e-commerce purchases. The collection points were created as part of Sunway’s plans to tap into the growing e-commerce industry in Malaysia. With a two-pronged approach in mind, Sunway also created the collection point such that they can double up as OOH media spaces. Sunway also said it is now focusing on expanding in the healthcare sector to the tune of more than RM1.2 billion by building five new hospitals in the country. It has set up Sunway Ventures as its corporate venture capital arm to seek out and identify new businesses that it can leverage to sustain its competitive edge as a corporation. In addition, the group is also investing heavily in championing sustainable development in line with its core values and to help differentiate the corporation from its competitors including enhancing Sunway City’s status as the model smart sustainable city in the region. In June 2017, Sunway was reclassified from the properties sector to the trading/services sector on the main market of Bursa Securities to better reflect the group’s long-term strategic ambitions and its diversified business interests. Cheah said that the reclassification signals Sunway group’s expansion plans. Meanwhile, Cheah added that Sunway needs to transform itself into a digital-age corporation with new mindsets that will help in spotting and seizing opportunities to realise its ambitions. With this transition in mind, Cheah said it has named Dato’ Sri Idris Jala (pictured left) as the co-chairman of Sunway Berhad. Cheah stressed that he will continue to lead the Sunway Group as its executive chairman. On the other hand, Jala will chair Sunway Berhad’s board meetings in helping to chart the strategic direction and realise Cheah’s vision for the conglomerate. “He brings with him a wealth of knowledge, practical hands-on experience, a highly valued reputation and international network, which will help me steer Sunway to new heights,” Cheah added. “I am delighted to join Sunway Group as co-chairman of the Board. Under the excellent leadership of Cheah, Sunway is a great company with proven track record of profitability and growth over the years. I consider this a real privilege to join the board. I look forward to playing my part in helping Jeffrey and the rest of the Board members pursue Sunway’s vision, strategic objectives and business objectives,” Jala added.